Bordeaux is synonymous with Wine throughout the world, and has been an inspiration for other wineries in the USA, Australia and Italy. As in a few other French regions, and I regret to admit it, Bordeaux wines did not flourish until the British got involved when Eleanor of Aquitaine married King Henry II of England. Starting in the 17th century, Bordeaux wine extended its reach to European markets. While sold in bulk until the 18th century, subsequent bottling of Bordeaux wine increased the export volume. As opposed to Burgundy where the ranking covers the field (clos), Bordeaux reputation is based on the estate that produces the wines. As a result we find a few classifications such as the famous 1855 Medoc Grand cru one, then later St Emilion (1955) and Graves (1953). Bordeaux has also put its name on the map by introducing “primeur” sales where Bordeaux enthusiasts could purchase wine a few years ahead of the release date, improving vintners cash flow. The recent 2009 and 2010 vintages that are exceptional have seen a massive increase in the “primeur” prices. Merlot, Cabernet Sauvignon and Cabernet Franc are the 3 main grapes used for Bordeaux red wines. The wine producer’s talent for blending them create the value of Bordeaux wines. Cabernet Franc and Cabernet Sauvignon are dominant on the left bank of Bordeaux, while Merlot is leading the blends on the right bank. 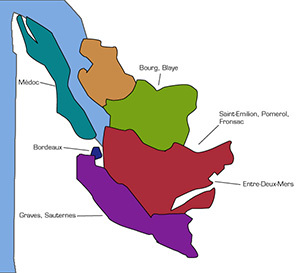 The Bordeaux region produces 25% of the French wines. Red wine represents 86% of wine produced in Bordeaux, with sweet white wines, dry whites, and also rosé and sparkling wines collectively making up the remainder. Bordeaux wine is made by more than 8,500 producers or Chateaux. There are 54 appelations of Bordeaux wine. The most famous are St Emilion and Pomerol in the Libournais area, St Estephe, Pauillac, Margaux and Saint Julien in the Medoc area.